Perhaps I was a little too ambitious with believing that I could get back to the 3-4 times a week posting schedule, while finishing up my degree and working twenty hours a week. Well, anyways I’ve been meaning to do a complimentary post to my morning skincare routine from this Summer, but I’ve realized that enough has changed that an update would make sense before moving onto the evening routine. 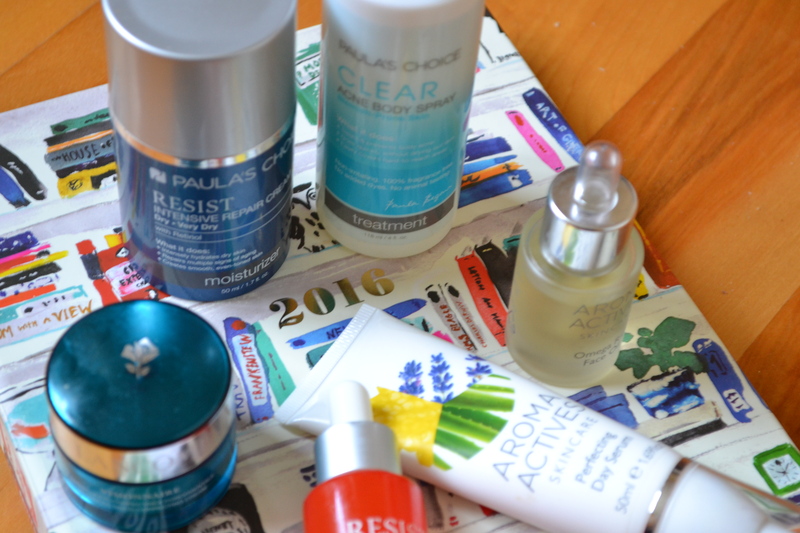 My thoughts and philosophy on skincare haven’t changed, nor have my opinions on my favourite products but I’ve run out of certain previous staples and have been using others in the rotation… I will warn you, though, that this post will be more than a little Paula’s Choice heavy. 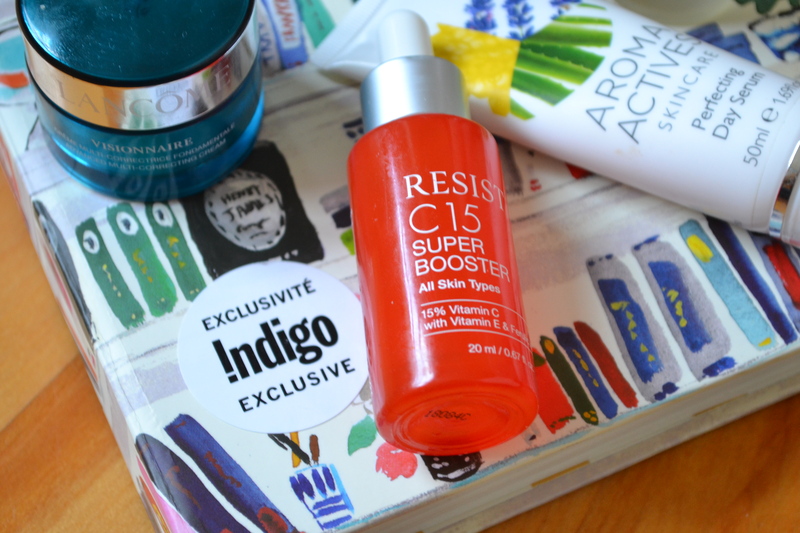 First off, I’ve been more consistent with my use of the Paula’s Choice Resist C15 Super Booster ($48), every single morning before moisturizer, rather than just applied on alternating evenings. And even though I was feeling pretty great about my skin as a whole, I swear I’ve seen improvement from adding a few drops of the antioxidant serum in terms of skin clarity, brightness and texture. After I ran out of the two moisturizers that had been in my rotation, I took the opportunity to order the Paula’s Choice Resist Intensive Repair Cream ($32) a month or so back and I’ve been using it on a nightly basis with pleasure. It does contain retinol in a decent concentration, but I find that I can use it on top of my topical Retinoid, along with a plethora of antioxidants and cell-communicating ingredients – including anti-inflammatory plant oils, hyaluronic acid and niacinamide. Although its touted as an anti-aging moisturizer, the ingredients do work wonders on younger skin to combat irritation and inflammation, while preventing signs of aging and the like. It does contain petrolatum and plant oils, however, so it does not have the lightest feel, but I wouldn’t call it particularly heavy. It just has a thicker, emollient texture that might not be suitable for those who have issues with clogged pores and any sort of oiliness. I do find it intensely soothing and hydrating overnight and also suitable for use underneath the eyes. It’s been a real saviour as it’s gotten a whole lot drier and colder here and my skin has gotten majorly dry as I’ve been suffering through a wretched cold. To be completely honest, I’ve switched the moisturizer up on occasion with the Lancome Visionnaire Advanced Multi-Correcting Cream ($92) that I received a sample size of in my Fall Luxe Box, even though I know that the jar packaging ensures that essentially any beneficial antioxidants will become unstable and that the ingredients aren’t impressive to begin with. I kind of just enjoy the soothing cream-gel texture and the light scent – that is not good for the skin. I will not be purchasing this, though, I assure you. With the same aforementioned order, I’ve added the Paula’s Choice Clear Acne Body Spray ($24) into my daily (morning) chemical exfoliation, alternated with my usual Resist Daily Smoothing Treatment for increased pore-declogging and anti-inflammatory action – but this is its secondary function, as I’m using it to deal with unsightly body breakouts. I enjoy just how light it is without drying or irritating my skin and how it adds something extra to my regular AHA-based regime. Thanks to my work, I’ve had the opportunity to sample two different products from the seemingly luxe essential-oil based line, Aroma Actives, and while I’ve been trying them out for about a month, they haven’t firmly found a place in my routine – nor have I completely decided my feelings on them. The Aroma Actives Omega Rich Facial Oil ($28) is definitely an indulgent oil that smells delightful and feels delightful on the skin, bringing increased radiance and all that facial oils do for a decent price, but it does only come with 15 mLs and when my skin is at its most sensitive, I find the ylang ylang essential oil content slightly irritating. But it’s still lovely. I’ve also been adding the Aroma Actives Perfecting Day Serum ($24) to my regime on occasion with pleasure. I love the high rosehip oil content and how its enriched with these extracts in higher concentrations, along with how soothing and lightweight it is on the skin – I’m just not seeing phenomenal results. Have any skincare recs for me?